Gluten Free? Yes. Pasta like consistency? Yes. Low Carb alternative? Yes. One of my favorite parts of October is seeing the giant Spaghetti Squash roll into Trader Joe's. 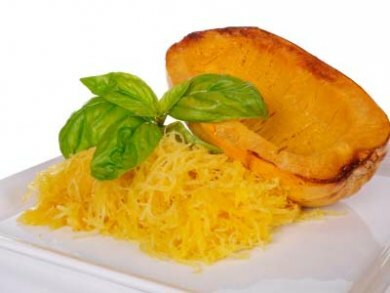 Unlike other squash, like Pumpkins, Spaghetti Squash get's its name from its spaghetti like texture. Its absolutely yummy and can be treated just like pasta! Toss it in your favorite sauce like tomato's with mushrooms and bell peppers or keep it simple and toss the Spaghetti Squash with butter salt and pepper! To make Spaghetti Squash halve a squash lengthwise scrape out the seeds and then bake at 350 degrees Fahrenheit for 30 to 40 minutes. Once the squash is cool enough to handle, run a fork through the flesh to create spaghetti strands.